Why does dairy get a bad rap? You may have noticed on your last trip to the local supermarket just how popular non-dairy substitute products have become. A plethora of ‘milk’ products made from soy, almond, cashew, oat, and rice are all vying for selection into our shopping carts. Alongside them, the traditional dairy products have also diversified into a seemingly endless combination of modifiers including: whole, low-fat, skim, raw, organic, lactose-free, lactase-added, milk protein-free, and fortified just to name a few. All of these choices can make anyone head spin. Today, we return to the basics to discuss what’s in dairy milk, demystify some of the facts and myths behind purported health effects and help you decide if dairy or non-dairy options are right for you. With its role as the nutritional support for infant mammals, milk is a complete nutrient package. Macronutrients such as carbohydrates in the form of lactose; proteins primarily caseins, whey, and lactoglobulins; and fats where about 70% is saturated and 30% unsaturated fatty acids are all found here (1). Milk is also a strong source of important minerals including: calcium, phosphorus and magnesium for bone health; sodium and potassium for water balance and muscle/neuron activity; and trace amounts of copper, iron, selenium, zinc and manganese which are responsible for a number of essential bodily processes (2). Finally, dairy products contain several vitamins including the water soluble B vitamins and the fat soluble A, E, D and K vitamins (3). Much of the calories in milk come from its fat content with 3.7% fat whole milk containing 145 calories, 1% low-fat containing 114 calories and 0% skim containing just 77 calories per 8-ounce glass. At first glance the nutritional value is impressive, however there are some terms and conditions that apply. When it comes to dairy products, choices really do matter. Nutrition content can vary significantly based on fat-content (skim vs whole), diet of cows (conventional vs organic), and form (e.g. as milk, yogurt, or cheese). As we’ll discuss below, many studies have pointed to the beneficial effects coming from the fat content in milk, specifically from whole milk and its fermented forms such as yogurt and cheese. Conversely, it is important to note such benefits have not been found in low fat or skim milk products. Yogurt is a particularly important form to highlight as it contains probiotic bacteria. For those of us who are lactose intolerant, the lactose sugar is minimal making it more tolerable and, as a beneficial byproduct, increasing the vitamin nutrient content. Organic dairy also has improved nutritional quality over conventional forms. In fact, a meta-analysis showed that organic dairy products contain higher levels of protein and a more favorable omega-6 to omega-3 ratio associated with disease prevention (2, 4). The discussion on whether or not dairy products are healthy has been hotly debated for many years. Many have pointed to the high fat content, worry for cardiovascular disease, or simply the fact that in evolutionary terms, milk was not meant for adult consumption. Luckily though, the past decade has seen several high-quality studies that have pointed us to some surprising conclusions. We’ve all heard the adage, milk builds strong bones. Dairy’s most well-known benefit is its support for bone growth in childhood and preventing bone loss later in life. The positive impact on bone health isn’t just limited to the calcium that it supplies, the unique nutrient profile of proteins, vitamins and other minerals is also thought to boost the effect. 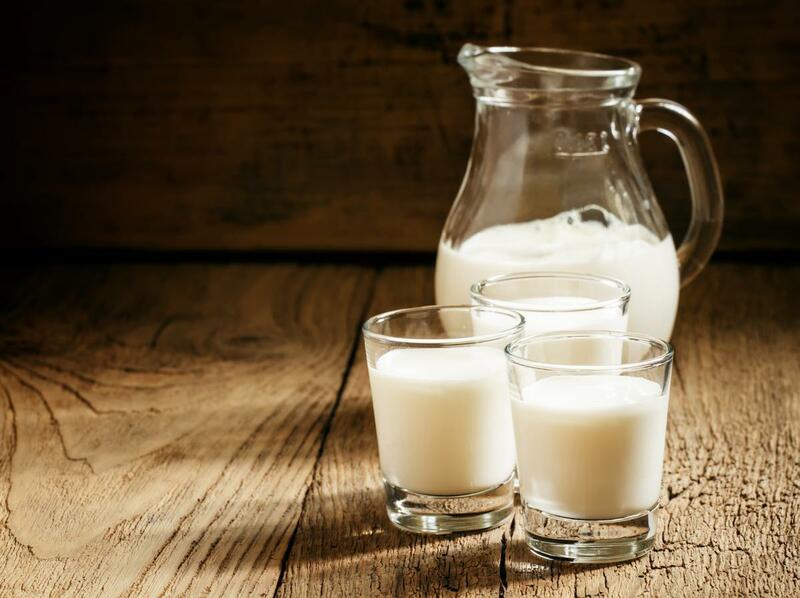 Interestingly, consumption of 3 servings of dairy products per day is associated with decreased risk for hip fractures and improved bone health in later life (5). Many of the concerns for dairy stem from its high fat content. It may seem counterintuitive, but some dairy products, particularly high-fat whole milk, yogurt and cheese have actually been associated with weight gain prevention. In a recent prospective study of 18,438 middle-aged and older women, those who had consumed more high-fat dairy were less likely to become overweight or obese when adjusting for age and other factors (6). Several other studies have similarly shown high-fat dairy having an effect on lower body fat in children, lower central obesity in men, and when combined with diet and exercise led to greater fat mass loss and muscle mass gain (7-9). The association of saturated fat consumption with higher LDL “bad” cholesterol has led to the idea that the high saturated fats in dairy may result in an increased cardiovascular disease risk such as stroke and heart attacks. However, a few meta-analyses have refuted that thought. Dairy containing both saturated and unsaturated fats preserves the ratio of the bad cholesterol with HDL “good” cholesterol (10). Evidence shows that milk actually has no increased risk of cardiovascular disease and that yogurt or cheese may actually have a reduced risk though more studies are need (11). Finally, adequate dairy intake of three servings per day has been shown to be associated with a decreased risk for type 2 diabetes and improved metabolic health. Moreover, dairy products have been found to increase insulin sensitivity and reduce inflammatory factors (12-13). At first sight, consuming dairy products seems like a quick fix to the many diseases we all face. However, milk does have its dark side. For starters, ~70% of the world’s population can’t have it without troublesome gastrointestinal side-effects such as bloating, nausea, and gas. For those with lactose intolerance or milk protein allergies, non-dairy options are the best way to go. Milk’s principle role for acting as a growth promoter in childhood also means it creates some potentially negative side effects in adult consumption. Notably, milk proteins have an effect on elevating insulin response and increasing a hormone called insulin-like growth factor-I (IGF-I) (14). One drawback is that the insulin and IGF-I signaling is directly linked to acne occurrence. Increased IGF-I levels have also been associated with breast cancer risk in postmenopausal women (15). However, it is important to mention that there have been some conflicting studies in premenopausal women and in Asian populations where some dairy forms showed reduced risk associations with breast cancer leading to the possibility of different genetic factors at play (16-17). While for men, high intake of dairy products was associated with prostate cancer (18). According to the studies, if you can digest dairy the most beneficial choice may be organic-branded, whole milk or fermented dairy options such as yogurt and cheese. If you are concerned with limiting your caloric intake or if you have genetic risks for cancers, acne or lactose intolerance then non-dairy replacements may be your best choice. However, do take note that non-dairy products like soy or almond milk do not replace the nutrient profile of dairy products. For aspects like your bone health, calcium and vitamin supplementation may be needed. If you’re lactose intolerant fermented dairy products could be the most ideal option as they contain little to no lactose and provide the beneficial effects of dairy. With the many options available to us now, there is plenty to experiment with to find the ideal accompaniment to your coffee or to dunk your cookies in. Listen to your body and find what you’re compatible with. Because in the famous words of one 24 year-long advertisement campaign, got milk? Mansson HL. Fatty acids in bovine milk fat. Food & Nutritional Research. 2008; 52:1, 1821. Pereira PC. Milk nutritional composition and its role in human health. Nutrition. 2014; 30: 619-627. Palupi E, Jayanegara A, Ploeger A, Kahl J. Comparison of nutritional quality between conventional and organic dairy products: a meta-analysis. J Sci Food Agric. 2012; 2774-2781. Rizzoli R. Dairy products, yogurts, and bone health. Am J Clin Nutr. 2014; 99(suppl): 1256S-1262S. Rautiainen S, Wang L, Lee IM, Manson JE, Buring JE, Sesso HD. Dairy consumption in association with weight change and risk of becoming overweight or obese in middle-aged and older women: a prospective cohort study. Am J Clin Nutr. 2016; 103: 979-988. Keast DR, Gallant KMH, Albertson AM, Gugger CK, Holschuh NM. Associations between yogurt, dairy, calcium, and vitamin D intake and obesity among U.S. children aged 18-18 years: NHANES, 2005-2008. Nutrients. 2015; 7: 1577-1593. Holmberg S, Thelin A. High dairy fat intake related to less central obesity: a male cohort study with 12 years’ follow-up. Scan J Primary Health Care. 2013; 31: 89-94. Josse AR, Atkinson SA, Tarnopolsky MA, Phillips SM. Increased consumption of dairy foods and protein during diet- and exercise-induced weight loss promotes fat mass loss and lean mass gain in overweight and obese premenopausal women. J Nutr. 2011; 141: 1626-1634. Huth PJ, Park KM. Influence of dairy product and milk fat consumption on cardiovascular disease risk: a review of the evidence. Adv Nutr. 2012; 3: 266-285. Lordan R, Tsoupras A, Mitra B, Zabetakis I. Dairy fats and cardiovascular disease: do we really need to be concerned. Foods. 2018; 7(29): E29. Hirahatake KM, Slavin JL, Maki KC, Adams SH. Associations between dairy foods, diabetes, and metabolic health: potential mechanisms and future directions. Metabolism. 2014; 63: 614-627. Dugan CE, Aguilar D, Park YK, Lee JY, Fernandez ML. Dairy consumption lowers systemic inflammation and liver enzymes in typically low-dairy consumers with clinical characteristics of metabolic syndrome. 2015; 35(3): 255-261. Melnik BC. Evidence for acne-promoting effects of milk and other insulinotropic dairy products. Nestlé Nutr Inst Workshop Ser Pediatr Program. 2011; 67: 131-145. Bradbury KE, Balkwill A, Tipper SJ, Crowe FL, Reeves GK, et al. The association of plasma IGF-I with dietary, lifestyle, anthropometric, and early life factors in postmenopausal women. Growth Horm & IGF Res. 2015; 25: 90-95. Dong JA, Zhang L, He K, Qin LQ. Dairy consumption and risk of breast cancer: a meta-analysis of prospective cohort studies. Breast Cancer Res Treat. 2011; 127: 23-31. Zang K, Shen M, Du S, Chen T, Zou S. The association between dairy intake and breast cancer in western and asian populations: a systematic review and meta-analysis. J Breast Cancer. 2015; 18(4): 313-322. Aun D, Rosenblatt DAN, Chan DSM, Vieira AR, et al. Dairy products, calcium, and prostate cancer risk: a systematic review and meta-analysis of cohort studies. Am J Clin Nutr. 2015; 101: 87-117.